Please Note: That this issue of Batman, created by Scott Snyder, Greg Capullo, and Published by DC Comics, in January, 2016, will feature open-to-order variant covers painted by Alex Ross, which will be shipped in opaque polybags. I thank you. TO QUOTE James Brown in The Blues Brothers movie: 'Can You See The Light?'. 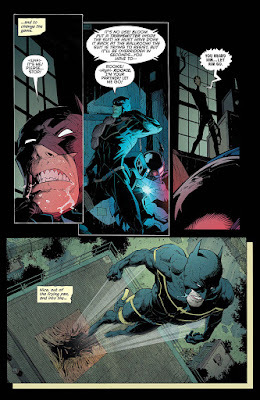 Loosely speaking, I'd say this months installment of Batman plays out as if it were three individual battles. In the first of these battles we get to see Bat-Jim fighting off his own possessed Bat-suit, being controlled by Mister Bloom (Yawn! Give us something new, will ya?). Then in the next of these battles we see Duke from 'We Are Robin' trying to escape from the Penguin and his henchmen (Booo! Run away!!!). And last, but not least, the final battle was basically Bat-Jim verses Mister Bloom (At-choo! I need a hanky). More importantly though, is that I also felt that through each battle, the overall narrative was able to redefine each character, one at a time, making their new state of play from here on in more dynamic and more intriguing than each of the battles themselves. In Bat-Jim's case, the tale was able to show that he's more than just the sum of his total Bat-suit. In Duke's case, it showed that his role as Robin mean's more than him just wanting to be a wannabe sidekick. In Mister Bloom's case, it showed that he's more than just one petal on a bud. And in the case of Bruce Wayne, well, parts of the plot showed that the best is yet to come. Now what do I mean by that last cryptic remark? No. I'm not telling. If I did I would spoil one hell of a great ending, and I wouldn't want to do that. What I can say, however, is that I did like the way this surprise revelation crept up on the narrative, slowly, slowly. Almost as if it was bound to happen sooner or later, spearheaded by a great scene were Duke and Bruce had a very dramatic heart to heart. Picture the scene. Half way through the book Duke is saved from the Penguin's henchmen by the sudden appearance of Bruce Wayne, resulting in them both walking down into a subway tunnel, where Duke tells Bruce what he feels about his new revitalized persona. At first, Duke's observations seem a little harsh, off kilter, rude even, especially since it's directed at a person who just saved his life. Yet as he goes on, and tries to justify to Bruce why he's saying what he's saying, giving reasons and explanations that make perfect sense, it struck me, BOOM! Duke is us. Duke is the total sum of us bat-fans who love Bruce Wayne being Batman. Like him, we want Bruce to snap out of his current situation, and we know that only he can do it in that 'I am Batman' type way of his. This point is then substantiated in another scene depicted later in the book; one where Jim says to his colleagues that he's pleased with what he's accomplished by being Batman, although he knows deep down inside that he isn't him. And why say that? Given that he's done so much good in recent months by playing Batman? Simple really. He isn't Batman. Not spiritually. Jim is a good foot-soldier and is able to weave around bureaucracy and red-tape unlike Bruce was before him. But then again, that's my point. 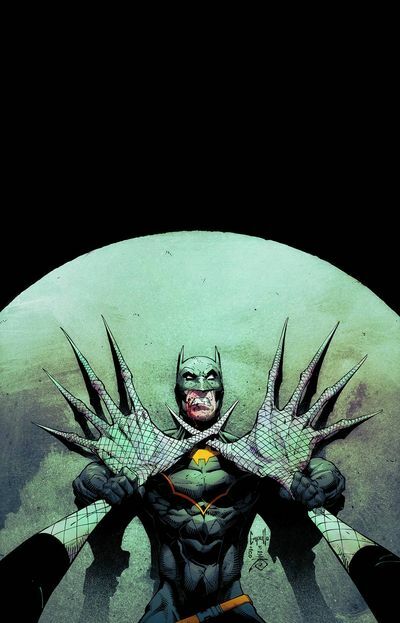 Bruce's Batman doesn't play nice with others despite being able to amass a group of loyal sidekicks along the way. Jim, on the other hand, doesn't need sidekicks, he needs an obstacle and a target to hit -- as seen in his fight with Bloom -- and isn't really up for playing the mind games Bruce was once so good at. That said, how will Bruce get his old mind back? Will Duke's confrontation set something off that will then lead to his return? Or will it be something to do with that man he sits down next to on the last page? No. I'm still not telling you how this issue ends, dear reader. Although it was a good issue and had some fairly nice yet uneven visuals provided by Greg Capullo (you know who you are), at the end of the day, Scott Snyder's sub-text was more compelling to read than the three battles it ultimately conveyed. For this months musical match-up I'd like to pair this comic book to the Elvis Presley song, 'Polk Salad Annie', mainly because of the reason given next. Ha! 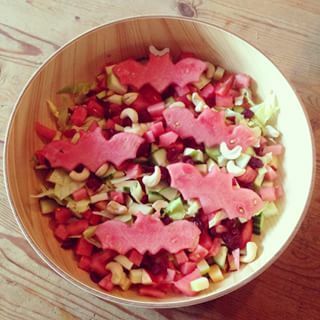 Bat-salad. This comic book is Bat-salad. And do you want to know why it's Bat-salad? No. My reasons don't have anything to do with Jim uttering this phrase whilst encountering Mister Bloom. This comic book is Bat-salad because it sound's healthy, implies nature and growth, and has a bat in it. Duke and the rest of the kids associated with 'We Are Robin'. Superman, Wonder Woman, and Lindsay Lohan. Barbra Streisand and Barry Manilow. Donald Trump and his Muslim friends. The cast of Friends with the cast of Desperate Housewives. Someone who's good at smiling.